A simple way that food manufacturers can accomplish this, while also lowering their ingredients costs, is by using Grande Bravo® functional whey protein as a replacement for high-fat, costly dairy ingredients like milk, butter, cream and cream cheese in their formulations. Functional whey protein’s clean, neutral taste and water-holding abilities make it easy to incorporate into many different applications. 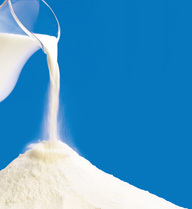 When whey is created as a byproduct of the cheesemaking process, protein can be isolated from the liquid mixture and turned into a whey protein concentrate (WPC). This involves an ultra-filtration process that removes the water, minerals, and lactose from the whey, leaving behind a more concentrated form of protein, hence the name. Grande Bravo is created using zero chemical modifications to have more desirable functionality for your applications, including improved shelf-stability, creamier mouthfeel, and richer texture. Whey’s clean, neutral flavor and superior water-holding abilities allow food technologists to maintain the same texture, flavor, and appearance of their original formulations, ensuring a consistent appearance and taste that won’t take consumers by surprise. Likewise, as a replacement for high-fat dairy ingredients, not only does functional whey protein help reduce fat and calories, it can also be used to replace artificial ingredients and clean up product labels as well. Want to learn more about how functional whey protein can help you create healthier products that cost less? Check out our Grande Bravo® in Action Video to see how our Grande Bravo® functional whey protein is used in real life applications.